Unfortunate it a big deal to import configurable products in Magento 1.9.x, simply the core doesn't provide this feature, but we have a solution just open the article below. 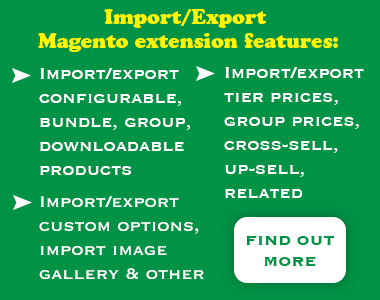 After launch Magento website you almost need to import products, but how we can do it? I think that the most optimal way of import products in Magento is using import/export profiles, but firstly we have to prepare import profile. By default in Magento we can import products data in two formats: CSV, ExcelXml. Hi, it was a good read! During my research, I have found another link https://magenticians.com/change-magento-admin-url/ which I found more in-detailed you can also add more value to your article which can be really helpful for those who have just started with Magento development. Still, it was a quick and concise explanation. © 2017-2019 MrMage.com. All Rights Reserved.